So, here’s our Q and A with Drayden. John Asher, who was an ambassador for the Kentucky Derby and the face and voice of Churchill Downs, died at the age of 62 on Aug. 27. 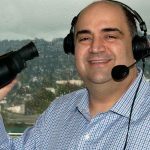 Frank Mirahmadi is no stranger to Santa Anita, having grown up in Beverly Hills and going to the track as a teenager. He would sit in the grandstand, where he would try to perfect his future occupation, doing practice calls of races, often in the voices of people who came before him. Mirahmadi’s path to this moment has been long. He’s been the caller at his share of small and large tracks across the country. He’s called the California fair circuit, Golden Gate and Los Alamitos. He left a job at Aqueduct in New York to come back to Santa Anita. He will continue to call the summer meeting at Monmouth when Santa Anita is dark. He says he’s lucky not to be in a wheelchair. Towards the end of the month, he’ll go under the surgeon’s blade. “If I don’t have surgery, [the vertebrae’s] going to continue to degenerate, and eventually I would be where I don’t want to be from the neck down,” he added. Sure, he was well into his final act in the saddle, and so, the incident in the post parade ring at Del Mar last month–the one that gave him whiplash, and a new injury to go with all the rest–can hardly be said to have cheated him his dues. Yet, there was, at least, one more scene to play out. The problem was the shepherd’s crook that appeared stage left. 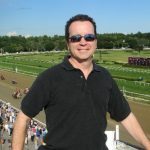 David Cohen — enjoying a banner season after resuming his promising riding career following an injury-induced hiatus spanning almost four years — is the recipient of JockeyTalk360.com’s fourth annual Comeback Jockey of the Year Award, presented by Red Brand Fence. 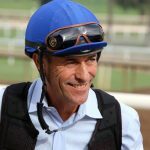 Cohen will receive the award during the Jockeys’ Guild Assembly luncheon Tuesday at Top Golf located adjacent to the MGM Grand in Las Vegas. Irad Ortiz will be honored as JockeyTalk360 Turf Jockey of the Year, with Drayden Van Dyke recognized as JockeyTalk360 Breakthrough Jockey of the Year. The JockeyTalk360 awards are in addition to the honors handed out at the luncheon by the Jockeys’ Guild at their annual assembly. The 34-year-old Cohen has won 109 races and almost $6.5 million in 2018 purse earnings through Friday, according to Equibase statistics. That’s the jockey’s most wins since 2012 and most purse earnings since 2010. In taking the Grade 2 Hill Prince on Have At It and the Grade 3 Matron on Lonely Road, Cohen won his first graded stakes since Golden Ticket’s historic dead-heat for victory in Saratoga’s Grade 1 Travers Stakes six years earlier. Cohen was among the sport’s rising stars when he was kicked in his lower right leg by his mount in the paddock at Aqueduct on Feb. 1, 2014. His badly fractured fibula and tibia required surgery involving a plate and six screws to repair. The cancer-related death of his father, California horse owner Morry Cohen, several months after the paddock mishap had the jockey struggling to heal not only physically but emotionally. He rode six races in late 2014 but was determined to have a torn meniscus in his right knee. Cohen suffered another personal loss a year later with the death of his sister, Dana. He did not ride again Nov. 30, 2017, at the Fair Grounds. 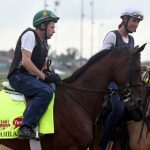 That proved the first step toward a big winter meet at Oaklawn Park, where he finished third in the standings with 37 wins, before rejoining the New York circuit last spring. Cohen has won 1,347 races and almost $50 million in purses in a career that started in 2004. “My leg now, I can’t even tell,” the jockey said his injuries. “It came back better than I ever could have hoped for. My agent, Bill Castle, is very tactical and we really wanted to come back and do well and win right away, not just pop up and say, ‘Here I am’ at Saratoga. 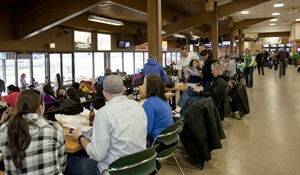 I was very fortunate with the support I had in my return at Oaklawn Park. That return was very well thought-out. I could have returned maybe six months earlier. But I just took a long time in the gym getting my body strong and getting my weight down over the time, the healthy and right way. “My father was an owner and breeder, so I respect that people are giving me their business, their money on the line, their opportunity that they could give to someone else. I’m coming back with the best riders in the world and saying, ‘Give me an opportunity.’ It’s not a sport that people can just put up money and say, ‘Let’s hope it works.’ The trainers, the exercise riders, grooms, everyone working their tail off day in and day out, I wouldn’t do that to them. I wanted to make sure I was in the right place, and I believe it showed. I had a lot of good feedback from horsemen. If it was the opposite way, I don’t think I’d have had the year I’ve had. Less than two weeks into the 2018-2019 Tampa Bay Downs meeting, trainer Gerald Bennett has thrown down the challenge. If any of his rivals have designs on unseating him from the top spot in the standings, they had better get busy. The 74-year-old Bennett, who often hauls his own horses from track to track, has a reputation for vigor and high energy rarely found at any age. Beneath his kindly exterior lies an unquenchable desire to pile up victories and add another title to his collection. Bennett has captured the last three Tampa Bay Downs titles and four overall, and his 40-horse stable, combined with his intuitive sense of where his horses can win, makes him a heavy favorite to add to that ledger. But it’s his seemingly tireless work ethic that fuels the Bennett barn. On most mornings, Bennett is out the door by 4:30 a.m., eager to greet his charges on the backside. He arrives by 5, walking through his barn and checking each horse to determine its condition and temperament. Bennett knows when his horses need time off from the racetrack. He took many of them to Classic Mile Park in Ocala after the Delaware Park meeting ended in October, and he believes that freshening helped his stable get off to a quick start here. “Classic Mile has a real good track surface, and it’s a quiet environment that helps horses relax,” he said. Bennett, who has been training Thoroughbreds since 1974, has cultivated a reputation for rehabilitating injured horses and those that have gone off form. He achieved his greatest success with Beau Genius, a minor stakes winner he picked up after his 3-year-old season. Beau Genius won 13 stakes under Bennett’s guidance, including the Grade I Philip H. Iselin and the Grade II Michigan Mile and One-Eighth Handicap in 1990. Some of his other top horses include Secret Romeo, Black Belt, R Angel Katelyn, Bucky’s Prayer and Fast Flying Rumor, who established a Tampa Bay Downs Beyer Speed Figure record of 108 in winning the Turf Dash Stakes in 2016. Bennett, the father of trainer Dale Bennett, has climbed to 15th all-time (and 11th among active conditioners) with 3,757 victories. The Springhill, Nova Scotia native trails the late Frank H. Merrill, Jr., by 217 victories for the top spot all-time among Canadian trainers. “We used to claim off each other quite a bit. 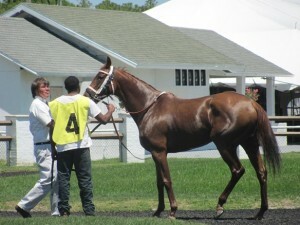 There was a lot of camaraderie among trainers then,” Bennett said. Michael Reavis scored his 2000th training victory with favored Mckinli’sbabyblues on Saturday afternoon at Hawthorne Racecourse, though the victory was in doubt until the final stride. Rider Carlos Marquez Jr. had Mckinli’sbabyblues in perfect stalking position, saving ground along the rail, swung out midstretch but ArticVortex got the jump on her while Reminisce, who led most of the way, still appeared to have something left. With a sixteenth left, the outcome was still up in the air but with a final late surge Mckinli’sbabyblues got up to win by a half length. Artic Vortex edged Reminisce by a nose for second. Mr. Reavis had scored victory 1998 in Friday’s ninth race with R Fast Life. He won Saturday’s first race with Saint Alexius. Carlos Marquez was also aboard for those two winners.